One simple motion is all it takes to block out 99% of those pesky UV rays. Shoei has equipped the GT-Air with a QSV-1 Sun Shield which is easily activated by a large switch on the side of the helmet. 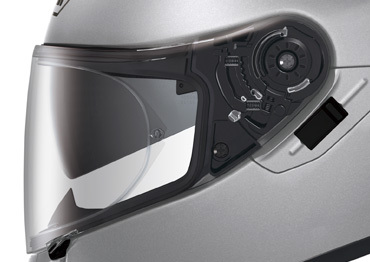 The newly designed CNS-1 face shield offers the rider a greater field of vision and their 3D injection-molding ensures an optically correct viewpoint in all directions and incorporates a 99% deflection of UV rays. Assisting the GT-Air in the fight against the wind is the improved base plate with included features like spring load to pull the shield securely to the helmet while in the closed position, and an easy, quick release system that makes changing shield on the fly a breeze. The GT-Air shield is equipped with a Pinlock® Fog-Resistant System that is without a doubt one of the most effective methods in the fight against fog. The Pinlock® system installs with a one-step procedure for easy installation and replacement. The construction of the GT-Air shell uses a very lightweight combination of fiberglass and other organic fibers. This blend not only makes the GT-Air very lightweight, but it is also a concoction that provides extreme overall strength and has been DOT approved. 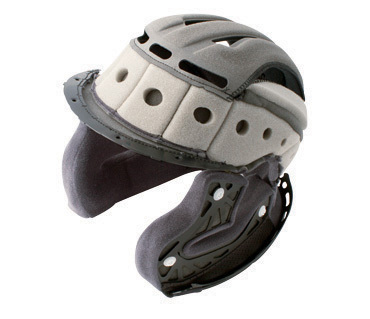 All of these features provide a solid first defense for your noggin. For greater comfort on all your riding habits, the new shell design eliminates the need for an externally mounted spoiler. The shells unique shape still offers the benefits of low drag, less lift, and excellent stability to help prevent the rider from experiencing fatigue. 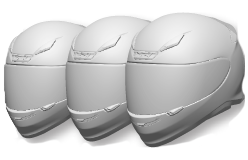 Shoei has been able to offer some of the quietest helmets on the market. They have achieved this with an onsite wind tunnel for testing all their innovations in-house. Shoei was able to utilize this information and tweak the design to provide ample air ventilation while significantly reducing wind noise. A larger lower vent was designed to allow the rider to quickly open and close it while wearing gloves. The upper vent has three positions for that precise level of desired air flow. And the exhaust vents have been placed in such a way that they utilize the negative wind pressure from the back of the helmet to pull the air through the helmet for maximum air flow. The new shell’s reduction in wind noise allows the rider to listen better to the environment and also blocks out unwanted road noise. 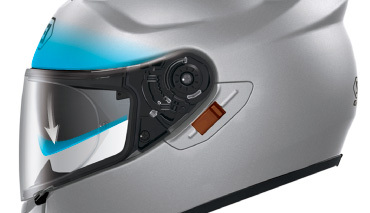 The 3D Max-Dry Interior System that comes in the GT-Air is washable and fully removable for replacement. 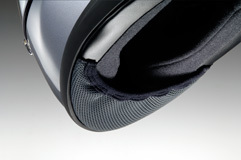 The comfort of this liner is due to the 3D technology Shoei uses to manufacturer them. The liner is designed for a fitment shaped for a riders head and has multiple cheek pad size options available for that perfect fit. This perfect fit system provides an ideal level of comfort while remaining secure for an interference-free riding experience at higher speeds. The material used in the liners are specially designed to dissipate sweat twice as fast as conventional nylon liners. The EPS liner in the GT-Air is comprised of varying densities which provide protection in different degrees to specific points on your head. 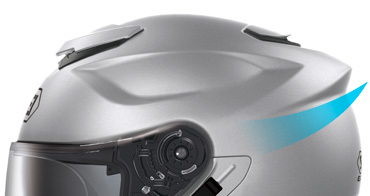 The GT-Air has individual air channels integrated inside the liner, providing uncompromised airflow throughout the helmet. These channels are also crucial in assisting with the crumple zones during impact. Using a varying density EPS liner, Shoei was able to cut down on even more weight, making the helmet not only compact but lightweight as well. One of the great features of the GT-Air is the three shell sizes that vary in use from XSmall to XXLarge. 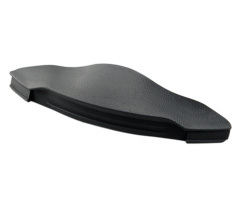 This allows Shoei to provide a much more custom fit per size instead of solely relying on thinner or thicker foam pads to make up the difference. The GT-Air offers, even more, wind noise and air reduction inside the helmet by attaching a chin curtain to the lower front end of the chin bar. The included breath guard is a feature that can assist in preventing fog from building up on the shield. It is installed by inserting the clips into the upper edge of the chin bar. Once installed the breath guard assists in directing the wearers breath down away from the shield and towards to bottom of the helmet. Note: If used in conjunction with Chin Curtain, the effect is not as noticeable since your breath has nowhere to escape. After the GT-Air does its job in protecting you in the event of an accident. One implemented feature that makes removing the helmet easier is the integration of the Emergency Quick Release System made famous by the VFX-W and X-Twelve models. 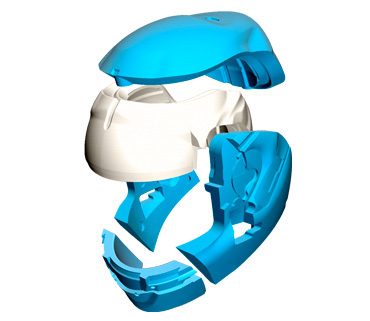 This system allows the cheek pads to be removed with ease making the opening wider for emergency personnel or first responders to remove the helmet without causing any undue stress or further injury to the neck.